The world's rarest whale has been spotted for the first time, in New Zealand, where two of the whales stranded themselves. 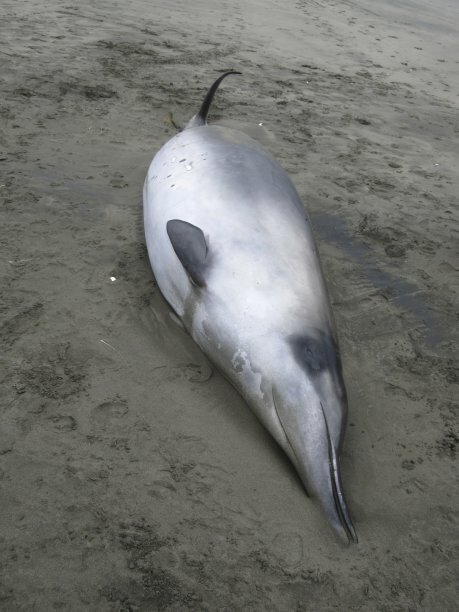 The two spade-toothed beaked whales, a mother and calf, stranded and died on Opape Beach on the North Island of New Zealand, in December 2010. The mother was 17 feet (5.3 meters) long and the calf was 11 feet (3.5 m) long. A report describing the whales and the analysis of their DNA appears in the Nov. 6 issue of the journal Current Biology. "Up until now, all we have known about the spade-toothed beaked whale was from three partial skulls collected from New Zealand and Chile over a 140-year period. It is remarkable that we know almost nothing about such a large mammal," Rochelle Constantine, a marine biologist at the University of Auckland in New Zealand, said in a statement. "This is the first time this species has ever been seen as a complete specimen, and we were lucky enough to find two of them." At first, the animals were thought to be much more common Gray's beaked whales. Their identity came to light following routine DNA analysis, which was done as part of a 20-year program to collect data on beaked whale species in New Zealand waters. New Zealand is a known hotspot for whale stranding, and it has the highest rates and greatest diversities of stranded whale species in the world, the researchers report. The New Zealand Department of Conservation photographed the animals and collected tissue samples. "When these specimens came to our lab, we extracted the DNA as we usually do for samples like these, and we were very surprised to find that they were spade-toothed beaked whales," Constantine said. "We ran the samples a few times to make sure before we told everyone." The researchers said they have no idea why the whales have remained so elusive. "It may be that they are simply an offshore species that lives and dies in the deep ocean waters and only rarely wash[es] ashore," Constantine said.